To merge your Facebook and Email accounts, go to www.Cartwheel.com, and log in with your preferred sign-in method. Next, click on “Settings” in the sidebar. Once you’re on the “Settings” page, you should see the Accounts section. Select which type of account you’d like to merge – Facebook, Google, or even your Target.com accounts – and follow the instructions. I merged my accounts easily and now all my savings and badges are consolidated! Plus, you can continue to sign in using your preferred method. Note: only one Facebook account is allowed per profile, although multiple Target.com accounts can be merged into a single Cartwheel profile. If you would like any additional information, you can always contact Target and ask for assistance with your Cartwheel account, 1 (800) 591-3869. 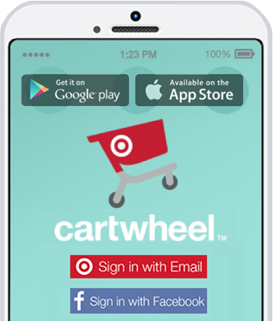 If you are not familiar with Cartwheel, this savings program introduced by Target, allows you to save even more when shopping in-store. Even better- these offers can be used with Target Coupons AND Manufacturer coupons for up to a triple stack! You can see my post HERE to help get you started. Worked for me!!! I hated that things were posting to Facebook so logged in with password. Nice to have it combined to one. Thanks! Does anyone know if you keep just as many offer spots after you merge the accounts? Like if I have 12 spots with my email account and another 12 spots on my facebook account, do I then have 24 spots after I do the merge? Thank you, thank you, thank you! It has been driving me crazy having two Cartwheel accounts. No more! It did combine my number of spots. Just like Rachel says- Thank you, thank you, thank you! Just realized I had this problem yesterday and was a little confused!! TY for posting! I have had the facebook cartwheel app crash in the checkout line! Super disappointing! I was told you have 3 days to present receipt and coupons/cartwheel to get an adjustment. OMG. I didn’t realize the merge would limit my spaces. I used my and my sons email for two accounts so I could double my space. Separated it into two transactions so I could use both. All it did was make it so whatever I add/delete on mine it does the exact same thing on his and visa versa. And since theres apparently no option to undo this, now I’m out 13 spots. It didn’t combine/;merge our total spots either. This is a real bummer for me. They really should allow you to undo any merges. Just ridiculous that you cant if you ask me! Is there any way to delete facebook account? I merged to wrong facebook and have tried to unmerge all day! Totally frustrated! Is there a new way to do this? It doesn’t work, but I just realized I have two accounts (one with my Facebook log in and one with my email). I have two accounts (one email and one facebook). I cannot figure out how to merge the two. I think the app/website has been update since your original post in 2014 – can you please tell me how to do this? Thank you, thank you, thank you! i just chatted with a target rep and apparently you can no longer combine accounts. wish i had discovered my 2 accounts sooner!